That’s right. There’s a lot to learn though so it’s important to cover some basics. Whereas chords are made up of several notes, you’ll need to get to grips with ‘one note at a time’ style playing to get started with lead guitar. Whether you’re into classic rock, blues, metal or even jazz, it’s the most common approach to lead guitar. There is! Playing one note at a time is in some ways easier and in some ways harder than chords. Easier because you don’t usually need quite so much finger stamina, but harder thanks to faster changes from note to note. Still, the basic principles are the same as chords: play each note with your finger close to the fret and use fingertips rather than the fronts of your fingers. This is probably a good time to look at our simple tabbed lead guitar line below. See if you can play through it. ‘Easy’ is a good place to start from and it only takes a bit of practice to put your own stamp on any lead line. We’ve played through our lick five times using different expressive fretting techniques each time to bring the lick to life. First we’ve played with no real expression before going on to use vibrato, hammer-ons and pull-offs, slides and finally string bends. Unfortunately, complicated-sounding terminology is common in music so try not to be put off by it. Vibrato is easy - you can try it right away; hammer-ons, pull-offs and slides are also easy but there’s definitely a ‘knack’; string bends may take a little longer because you need to develop finger strength. We’ve recorded our lick in the most common musical time ‘signature’. A steady four count will help you stay in time with the backing. 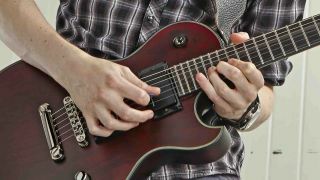 Fret a note, pick the string and ‘vibrate’ your fretting finger as the note rings out to create a wobbling sound effect. It works best on longer notes. Fret a note, pick the string, then quickly and firmly press down onto a higher fretted note without picking the string again. The opposite of a hammer-on. Fret a note, pick the string, then pull your finger away to sound a lower note fretted by another finger. No surprises here. Simply slide along the string from one note to another. Keep pressing down as you slide or the notes will die out. Your aim is to bend the string to change the pitch to a higher note. Fret with two or three fingers for maximum strength. Play through the line without using any expressive techniques, making sure you can manage to moves from note to note. Bars 1, 2 and 4 can all be played with your first and third fingers; bar 3 has a few more options. As you gain confidence, try using some expressive techniques.